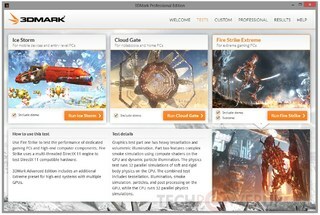 3DMark includes everything you need to benchmark your hardware in one app. Whether you're gaming on a smart phone, tablet, notebook, laptop, desktop, or a high performance gaming PC, 3DMark includes a benchmark designed specifically for your type of device. And it's not just for Windows. You can compare your scores with Android and iOS devices too. It's the best 3DMark we've ever created. Good bench program and gives you a good estimate of how your computer should run for futuristic that will rip your computer apart. And for the 9600 xt, that is definately some older technology especially when you are not using pci express x16 which allows the graphics card to have the information to be transferred on a basic two lane highway instead of an old agp slot which it only allows it to go in one direction at time. So update your system before posting a bad review on it because of your older system. And they do have mad pci express boards now so you can still use your 3200+ if you choose to do so. the absolute best piece of hardware to test system stability. crank up that FSB and loop 3dmark03 or 05 overnight. if it's running when you wake up, congrats on a nearly 100% stable overclock. If this runs like crap on your comp, then get 3dmark2003. Those of you who gave this program bad ratings because of your s***ty hardware, just stfu and leave reviews to people that know what they are talking about, and actually have recent hardware, not 4-year-old graphics cards. I am very impressed, this thing gives my overclocked A64 FX55 quite a workout, and comes quite handy when overclocking my 6800, to see if I have any improvements. Best graphics benchmarking out there, period. Great program. Obviously nothing can beat a real game as a gaming benchmark. But you can't fault this as a synthetic benchmark. It is always ahead of the game stressing your computer to the max, therefore showing you how your computer will perform with next year's games (which is important when considering a new computer). A poor tool. Nice and pretty demo, but as a benchmark tool it's been both ahead of it's time for a few generations as well as a easily tweaked tool for the vid card manufacturers. It runs like puke on my hardware with Athlon 64 3200+ and 9600xt, which is decent hardware. By the way, to the previous poster, you need to tweak your AGP available RAM in the BIOS, bump it up a tad. I got an error every time when Game 2 demo starts. It is DX9 control applet saying that i'm out of video memory. And i'm Running on Radeon 9600XT with 128MB memory. which real engine would that be? "Sorry, what does this program do? A syntethic benchmark program... absolutely useless... playing some games is better." funny how it includes games (thus the size), with real engines, real shaders, etc.